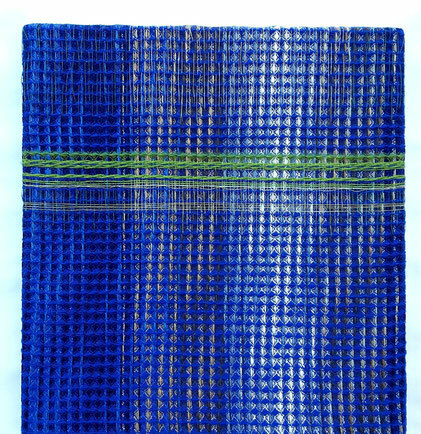 a work as contribution to the exhibition of the juried contest "Water-Land" of the Textile Festival 2015 in Leiden. 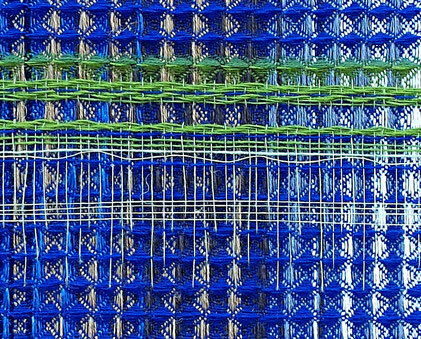 I decided not just to weave one piece especially for the exhibition but to set it up as a small project to try out different techniques, colours and materials. 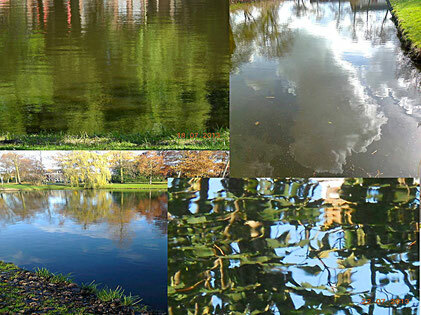 I started of by making pictures of reflections in all kind of surroundings; canals in the city, rivers and small ditches and with or without buildings or vegetation on the side. That's how I found out that I liked the reflections with lots of ripples in the water. 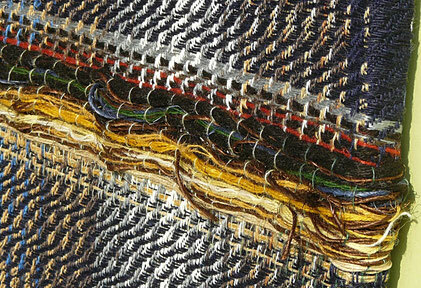 At the same time I was inspired by the work of the Canadian tapestry artist Mariette Rousseau-Vermette, who pioneered innovations in the fiber / textile arts during the 1960-80s. I especially liked "Direct", a huge tapestry of almost 6 meters long and 2.5 meters high created in 1969 and that I saw at the exhibition "Decorum; carpets and tapestries by artists" in Musée d’Art Moderne de la Ville de Paris. 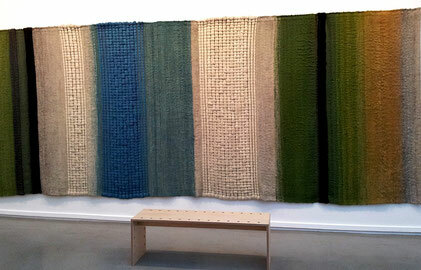 Characteristic of this work is the alternation between smoothed felted parts and parts woven with very thick material. 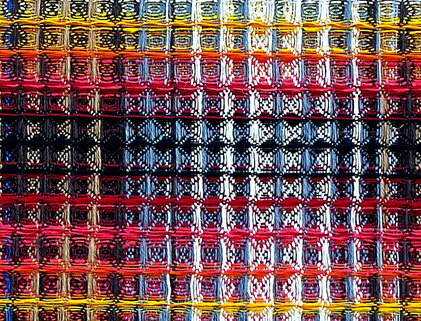 I wanted to capture that in a loomwoven double weave. 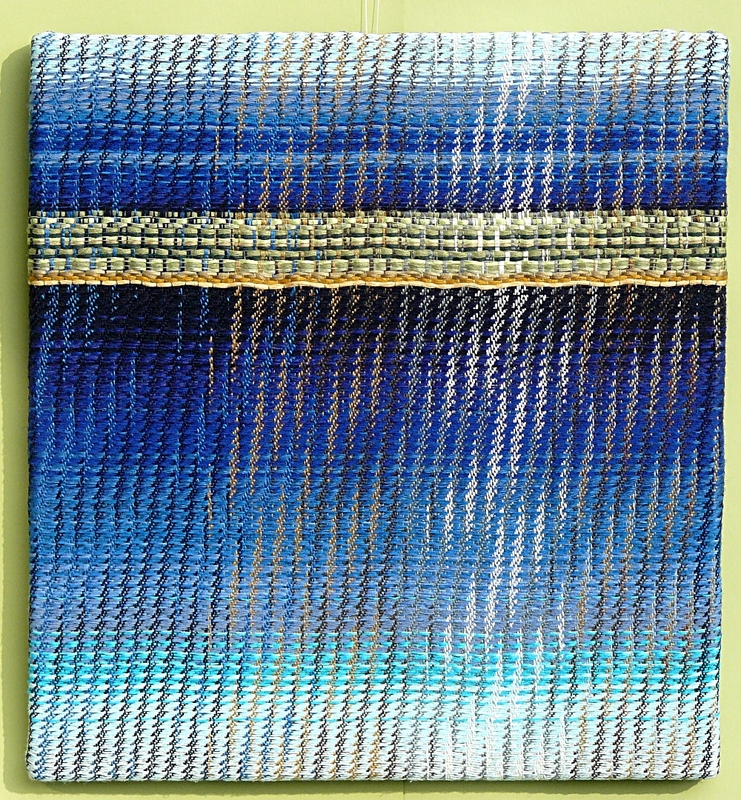 I immediately thought that the ripples in the water could very well be displayed with a mixed twill weave with shifting colours. 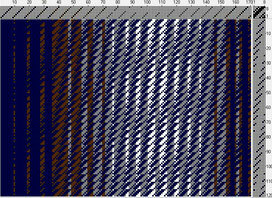 I started testing this on 8 shafts in the weaving program Winweef. 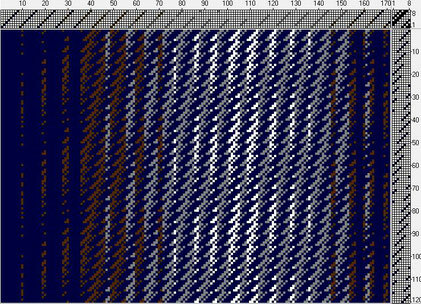 This is a 1/1/4/2/ twill, a composite twill with multiple lines. 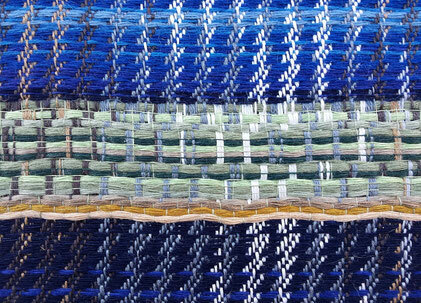 And from left to right in the warp the colours gradually shifts from blue to brown, grey, white and back to blue. 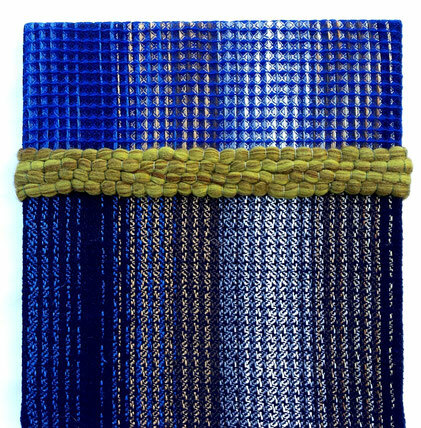 I continued testing other variants of twill tie-ups; 1/1/3/3, 1/2/3/2, and different treadling sequences for different twill angles. 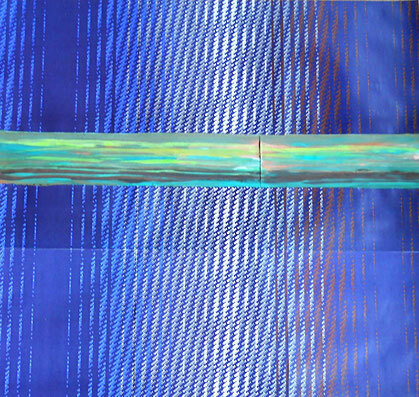 As a second step I focussed on how to integrate a horizon into the ripple pattern. 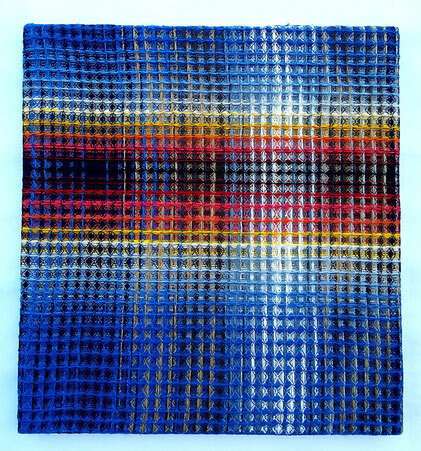 Therefore I went back to the drawing board, printed a big print of the multicoloured twill and and tried out a number of "horizons", both painted and with yarn. 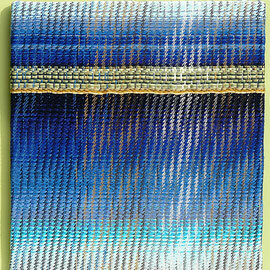 I extended the twill to 12 shafts and used four extra shafts for the second warp to be able to weave the horizon on top of the ripple. 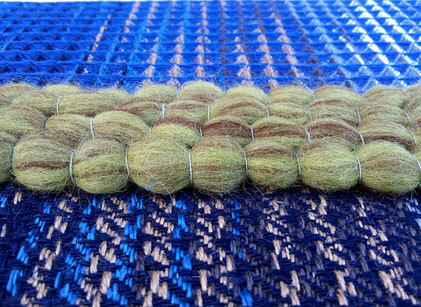 In order to maximise the effect of the weft I needed the second warp to be as thin as possible. 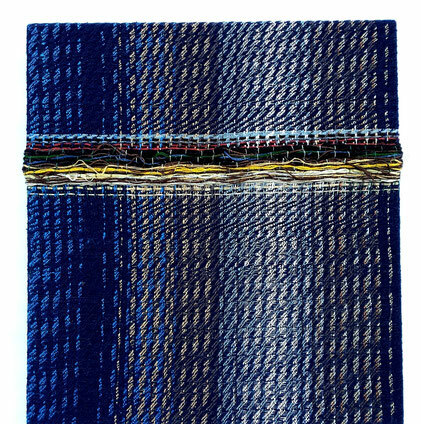 The material for the first warp is cotton (dark blue) and linen (blue, 3 shades of brown, grey and white). 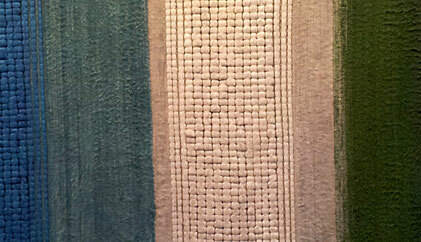 The material for the second warp is very fine linen (3 shades of green). 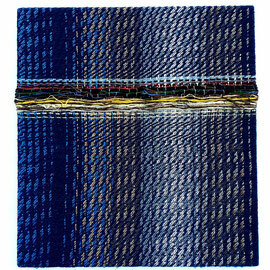 The weft is dark blue cotton woven in 1/1/8/2 twill. 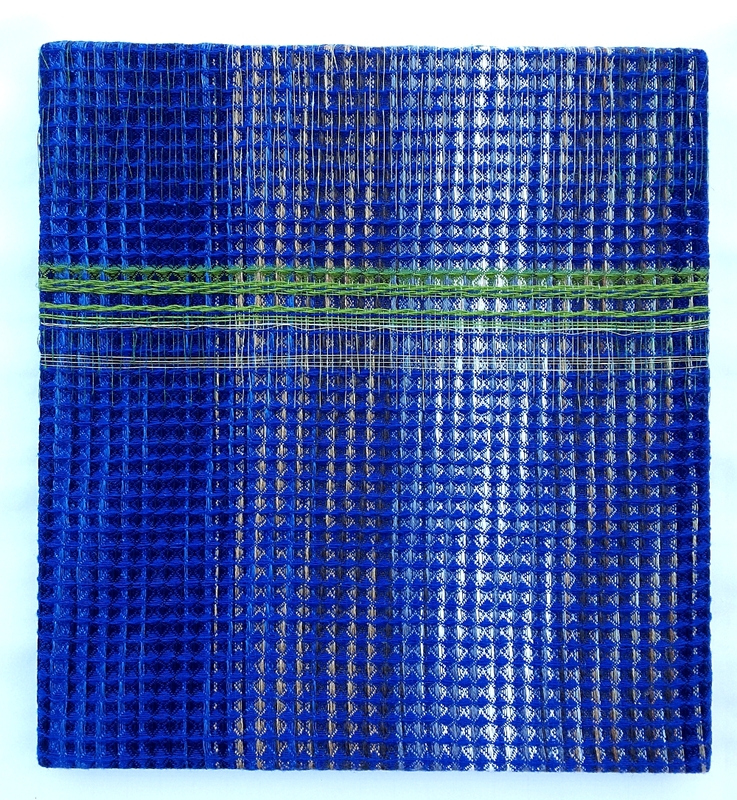 Except for the horizontal strip, which is plain weave with combed wool in green, yellow and brown. This part should represent the Mariette Rousseau-Vermette - effect, but it could be a bit more exuberant. 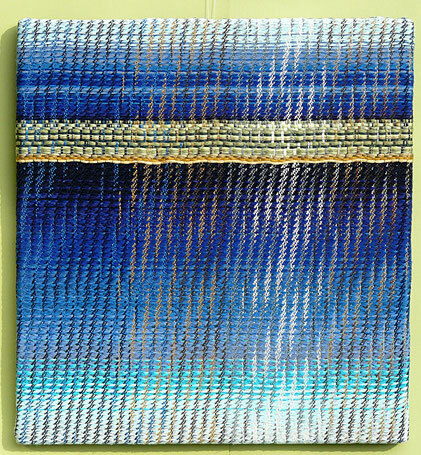 I like the ripple effect caused by the shifting colours in the twill weave. 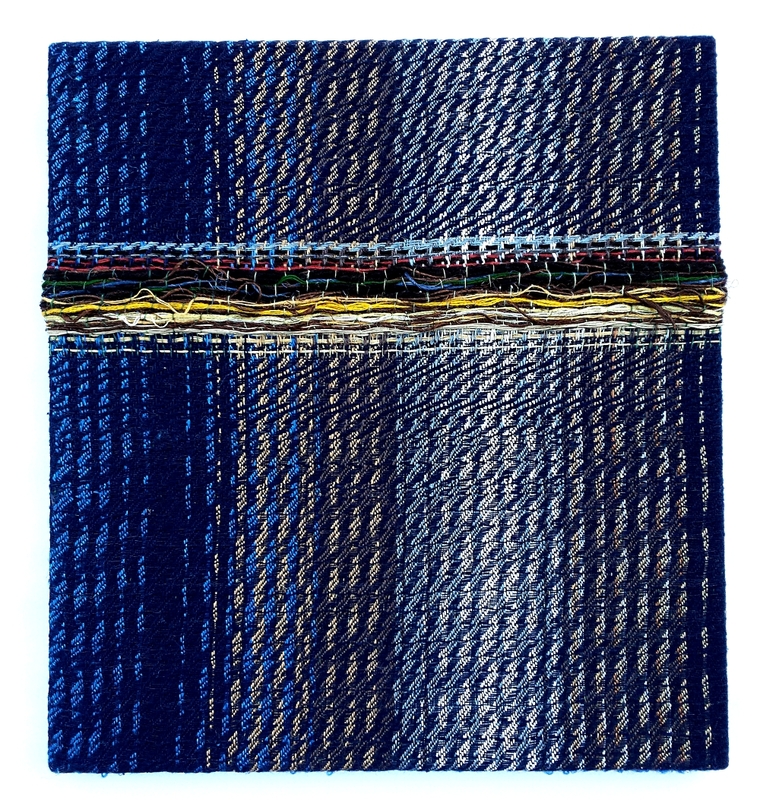 The weft is dark blue cotton woven in 1/1/8/2 twill, except for the part direct above and below the horizontal strip. 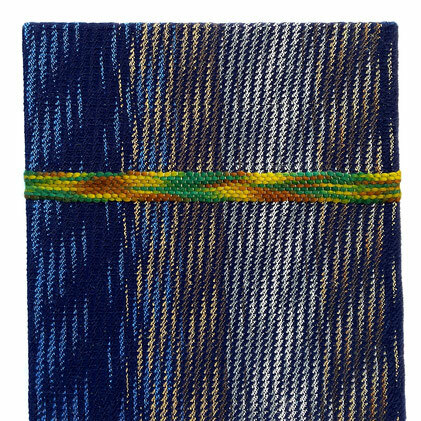 Here I tried a more wavy effect through a slightly adapted tie-up and treadling. 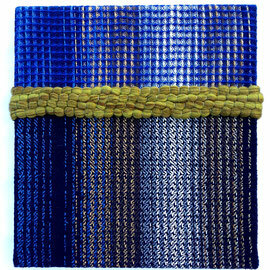 The horizontal strip is plain weave with all kinds of material in bunches; very thick dark brown wool, brown and blue rope, yellow linen and wool and red linen. 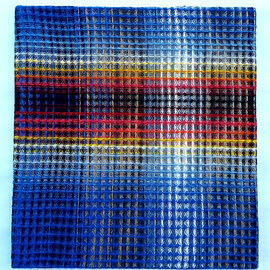 Reflection 3 is also woven in 1/1/8/2 twill, but with a colour transition from very light blue to brighter blue colours and darker blue shades . 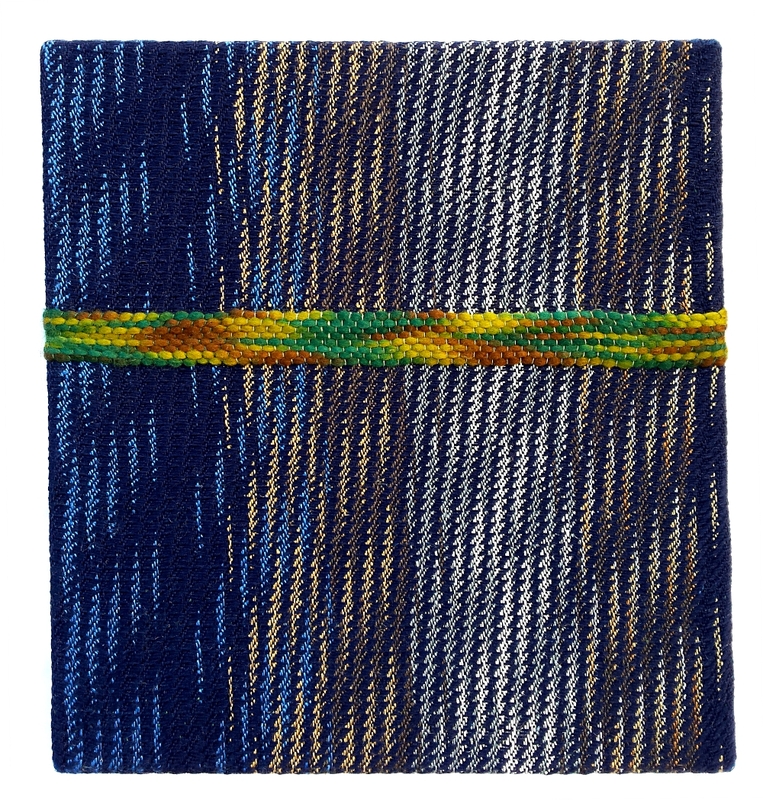 The horizontal strip is thin linen equal to the warp. 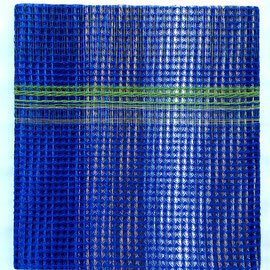 Reflection 4 is a waffle weave with a weft of bright blue linen. 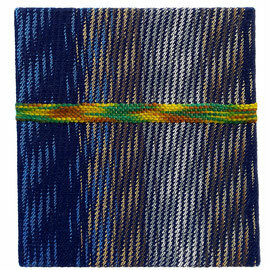 The horizontal strip is thin linen equal to the warp but with long warp floats. 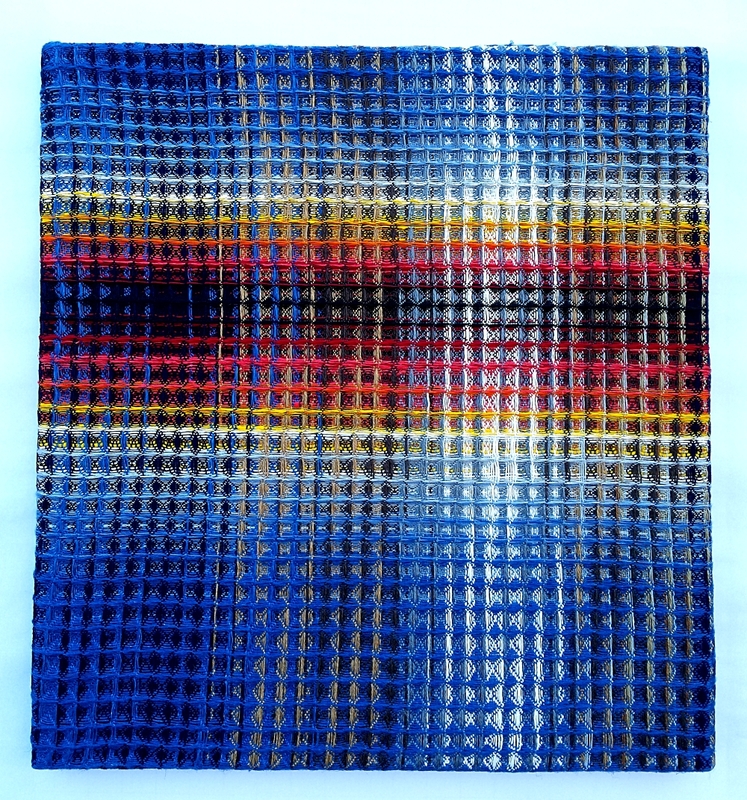 Reflection 5 is a combination of a twill weave at the bottom and a waffle weave at the top. The horizontal strip is very thick combed wool. 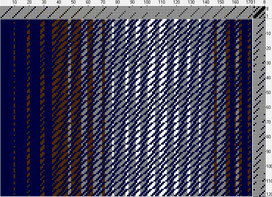 Reflection 6 is a waffle weave. 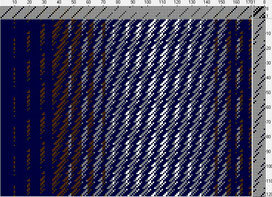 The second warp was not used. 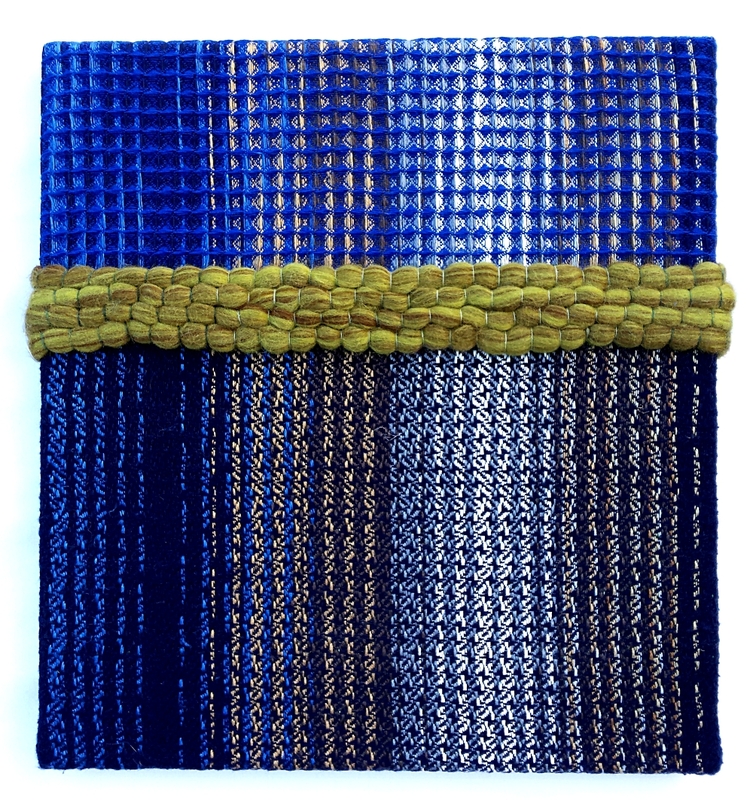 The horizontal strip was created by altering the colours of the weft creating a sort of sunset. I decided to send in Reflection 4. 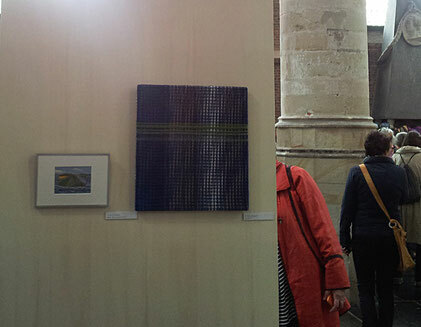 It was exhibited at the 5th Textile Festival from 13 to 16 May 2015 at the Pieterskerk in Leiden.